NOW AVAILABLE ON PRINTS AND CARDS. A4 Prints and A3 Prints are now available of this painting and are all beautifully mounted and backed ready to frame. A4 prints are $90.00 and A3 prints are $120.00. Cards with envelopes are $3.00 each. 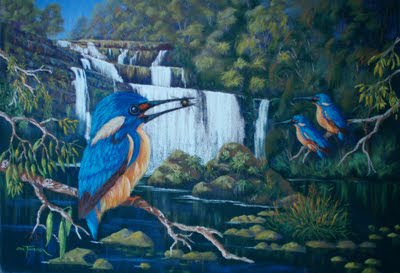 KINGFISHERS are beautiful birds found in many places of the world including Australia. These Azure Kingfishers can be found in many areas of Victoria near waterfalls, waterways and rivers. They mainly eat insects and small reptiles. They love to perch high in a prominent position over the water and swoop down to retrieve their prey. Their magnificent plumage is quite spectacular. Don't miss out on these very collectable Limited Edition Prints - only 30 will be printed.